Looks great, love the Ruby Red in the sunlight. Very nice and shiny indeed. Makes me wanna click my heels together three times and say......wow, just wow. Hey Laserred.. I have the opposite problem.. All of my other vehicles are silver. 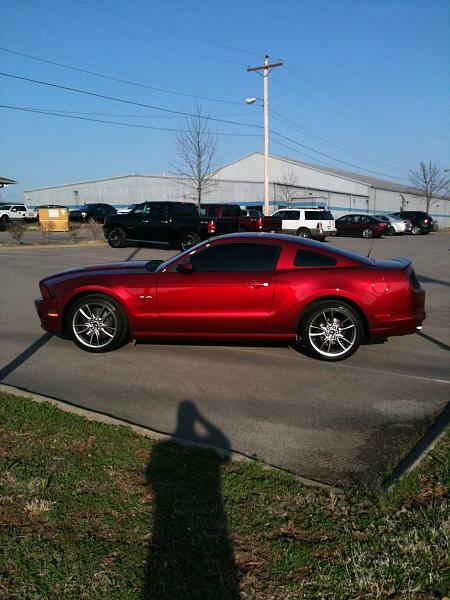 I went to order a 2014 GT in Silver or g Gray but at the last minute went with Ruby Red. The Color looks amazing in the Sun. It looks to have other colors in the clear coat..
nice is that your shadow in the second pic? 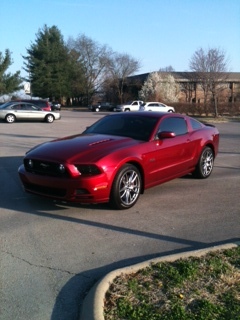 Nothing like a clean shiny Ruby Red Stang! In the right light it looks like you could just dive in and swim around. Amazing color! I love mine. Yours looks awesome. I love the color, too! I have a '14 convertible with a tan top. Very nice! We parked by a Ruby Red convertible last week, top down, windows up. My wife said "Is that the car you're saving for? Ooooh...let's see if we can get it in THIS colour!" Definitely on my list when I start looking next year. That colour shines like a new dime. Last edited by Noilly Pratt; 7/8/14 at 12:31 PM.